Occupational Therapy (OT) addresses a combination of cognitive, physical and motor skills in order to gain age-appropriate independence and participate more fully in life. For individuals with Autism Spectrum Disorder (ASD), occupational therapy often focuses on skills for appropriate play, leisure, learning and self-care skills. For instance, goals may include independent dressing, feeding, grooming, and use of the toilet, along with improved social, fine motor and visual perceptual skills. Many individuals with ASD also have challenges in processing sensory information such as movement, touch, smell, sight, and sound. Sensory Integration (SI) Therapy identifies such disruptions and uses a variety of techniques that improve how the brain interprets and integrates this information. In addition, Sensory Integration Therapy can allow a child or adult with sensory integration difficulties to become more “available” for learning and social interactions. As such, Occupational Therapy sessions are conducted in our well-equipped sensory room including a swing, trampoline, and a ball pit. Occupational Therapy typically begins with an evaluation to assess functioning and to form the basis of a treatment plan that includes measurable data-driven goals. Treatment notes of daily progress are sent to our internet-based parent portal to ensure parents have access to information regarding progress on an on-going basis. For more information on Occupational Therapy Evaluations, please see “Evaluations” under “Children and Adolescent Services” tab. 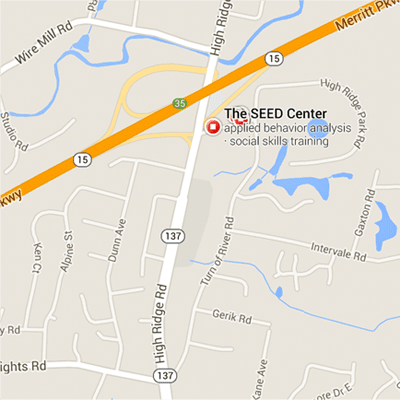 Call The SEED Center of Stamford today to get your child signed up for occupational therapy 203-674-8200.